Opened on the same day the local Hauxi Village celebrated its 50th anniversary, Longxi International Hotel became an internationally publicized icon of the village’s rapid growth. The once rural farming village has transitioned into a far more urban setting and the local government considered building vertically as means to continue growth while preserving remaining undeveloped lands. 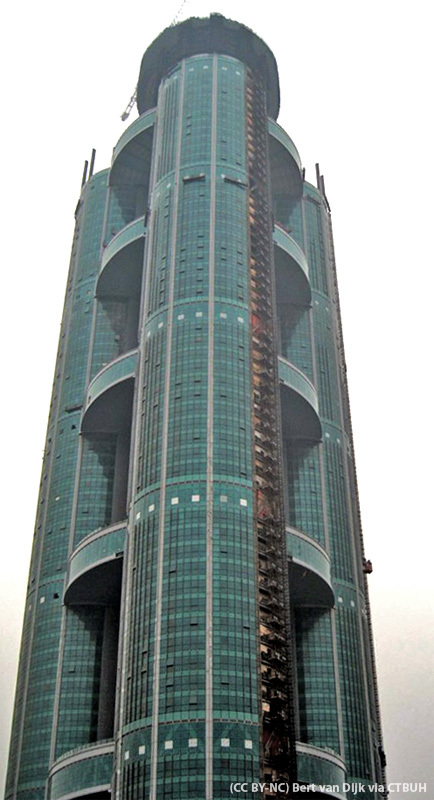 Partial financing for the tower was provided by 200 villagers through purchasing shares in the building for 10 million yuan each, an investment which entitles each shareholder to revenues earned from the building’s operations. The construction of the tower was viewed as method of increasing tourism to the village while also improving the local quality of life. The tower contains a hotel with more than 800 suites as well as an exhibition hall, gardens, swimming pool and on the 60th floor, a statue of an ox created with one ton of gold. 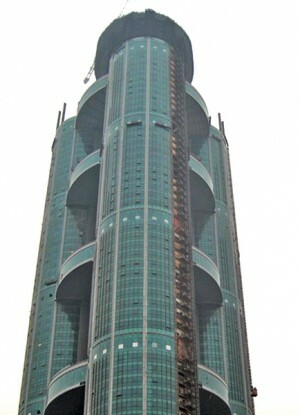 The tower rises from a petal shaped podium as three large cylindrical towers, inspired by a cluster of bamboo and was arranged around an open void reminiscent of a traditional courtyard flanked by buildings. The tower’s interior was then anticipated to function as a series of interlocking architectural features in the implied form of a traditional village layout with homes, streets and gardens vertically extruded skyward. The open arraignment around the interior void also then provides for maximizing view sightlines in all directions. The tower is then topped with large golden sphere housing one of the world’s highest revolving restaurants serving guests with panoramic views of the largely low-rise surroundings.